WASHINGTON (CNN) -- Weapons crossing the border from Iran to Afghanistan may be winding up in the hands of the Taliban, the hard-line Islamic militia that is battling U.S.- and NATO-led forces in Afghanistan, U.S. and British officials said. Coalition officials in Afghanistan said they have intercepted Iranian-made AK-47s, C-4 plastic explosives and mortars. One explosively-formed penetrator bomb (EFP) that was found can pierce American armor, a NATO official said. The EFP is similar to the weaponry the United States says Iran has provided to militants in Iraq, but the NATO official said the weapon has not been traced directly to the Iranian regime. But a U.S. official who requested anonymity told CNN the United States believes Iran's supreme leaders know about these operations and could stop them if they wanted to. Another U.S. official said Iran still sees the Taliban as an enemy but has a history of dealing with people it considers "nasty" as long as it is "congruent with Iran's overall objectives." In this case, Iran is "working the Taliban angle" to "bleed the U.S." in Afghanistan, the official said. The British government called any provision of arms by Iran to the Taliban "unacceptable." "We know about illegal movements of munitions across the border from Iran to Afghanistan, destined for the Taliban," the British Ministry of Defense said in a statement. "We are concerned that some of these munitions are of Iranian origin." A former U.S. intelligence official said Iranian activities in Afghanistan would be a disturbing development. "That suggests the Iranians are now turning up the pressure on the NATO forces in Afghanistan," said former national security official Bruce Riedel. "Since Iran has one of the most extensive intelligence networks in the entire country, they would have an enormous capability to cause mischief." An Iranian official at the United Nations denied his country is giving weapons to the Taliban, noting that the Iranian government has long supported Afghan President Hamid Karzai and has always seen the Taliban as an enemy. Both U.S. officials and outside analysts said any malicious intentions on Iran's part would only be directed at the United States. The majority-Shiite Iran would not want the Taliban to gain too much strength, they said. "Iran and the Taliban nearly went to war in 1998 over the killing of 11 Iranian diplomats in Afghanistan," said Afshin Molavi of the New American Foundation, a non-profit, public policy institute based in Washington. "And the Taliban are also virulently anti-Shiite. So if these allegations are true, Iran is playing a very dangerous and delicate game." 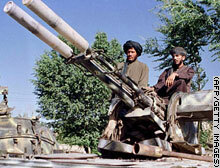 A file photo of Taliban fighters near Kabul.